Take some dramatic mountain peaks, add a sprinkle of red-roofed houses chasing higgledy-piggedly down the mountainside, small houses with wrought-iron balconies and roof terraces with magnificent views. 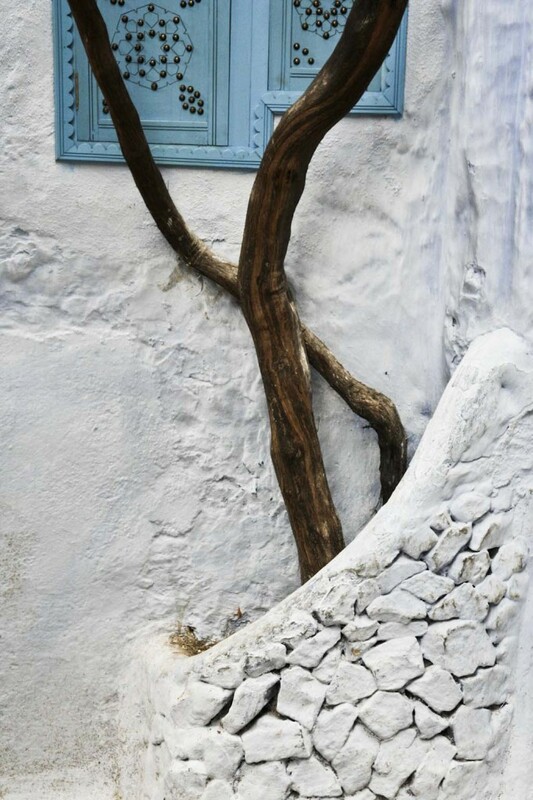 Now wash it all in an indigo-blue rinse and you have the delightfully laid-back town of Chefchaouen in northern Morocco. Originally built by Riffian tribesmen in 1471 as a base for attacking the Portuguese in Ceuta, the isolated village grew markedly when Muslims and Jews escaped Granada in 1494 and came to settle here. The refugees built houses with Spanish-influenced patios and balconies. The town was fiercely xenophobic and Christians entered on pain of death until the Rif Wars of the 1920s, when the Spanish took the town and remained until independence in 1956. It’s all very peaceful now, though, with cafés around a pretty square, a red sandstone kasbah squat on the edge of the square and some good walking in the Talassemtane National Park and the Rif Mountains. There are lots of reasonably-priced places to stay, some unpretentious restaurants and excellent shopping in the blue-washed medina. And why the blue? You’ll hear some curious explanations from deterring flies to keeping out Christians. The truth is that until the 1930s, everything was a traditional Muslim green, but then someone must have got a job lot of blue paint and it became the fashion. The blue is renewed every couple of years and is always slightly different – perhaps with a hint of mauve, or a touch of turquoise. 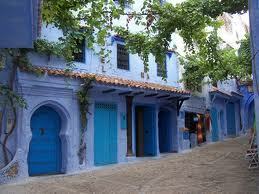 But it’s now such a part of Chefchaouen that we couldn’t imagine the town any other way. The medina is the place to wander and explore. Start in the main square, Uta el-Hammam, that’s surrounded on three sides by pavement cafes. On the other stands the commanding Kasbah with its peaceful garden. From the square, take any street leading up. Chances are you’ll get lost, but that’s just fine. Chaouen’s medina is small and manageable, and you won’t stay lost for long. Around the mosque are a couple of antique shops that still have old Jewish menorahs and hands of Fatima with a star of David in the middle, artefacts left over from the town’s Jewish history. Don’t miss a visit to the Ensemble Artisanal at Place el Majzen (open 10h00-14h00, 16h00-18h00). It’s a wonderful place to watch craftsmen and women at work: from painters to knitters, weavers to wireworkers. On the north-eastern side of the medina at Ras el-Maa, the river comes tumbling down the mountainside. It’s here that women do their washing and there’s a gentle riverside path that leads down into the new town. For something a little more strenuous, head for the old Spanish Mosque on the hill. It was built in the 1920s but the locals never really took to it, and it fell into neglect. Now the Spanish government has restored it as a cultural centre. Cross the bridge at Ras el-Maa and follow the mountain path. There’s more serious trekking in the Talassemtane National Park in the Rif Mountains encompassing fabulous vistas, rural villages, interesting geographical formations like God’s Bridge, and fascinating flora and fauna. The main entrance to the park is just northwest of Chaouen next to the campsite, where there’s a small eco-museum. You can hire a guide through Concierge Morocco. We can organise anything from half-day walks to 5-day treks that can include visits to honey or goats cheese co-operatives and rural markets. Accommodation is in comfortable gîtes or village homes. Expect to pay around Dh500 per person per day; more if you use a vehicle or a mule. This is not only fun, but supports local people in their quest to move away from reliance on cannabis-derived income. But it doesn’t have to be all action. Head to the main square and copy those old men in their djellabas that you’ll see outside the Kasbah. Sit down and relax, sip a mint tea and watch the world go by. All the pavement cafés around Place Uta el-Hammam serve similar fare at very reasonable prices: continental breakfasts, Spanish-influenced tortillas and Moroccan tagines and couscous. Discover your favourite and while away a few hours. Cafe Clock opened its doors in August 2018 with a refreshing menu of bistro-type food, the signature camel burger and various options for vegetarians and vegans. Expect Sunday Sunset concerts as in Fez and Marrakech, and other cultural events. La Lampe Magique is painted bright Chaouen blue on all three floors and has a wonderful roof terrace overlooking the Place Uta el-Hammam. The food is very good: try the selection of Moroccan cooked salads to start, followed by the lamb and prune tagine. For a special treat, take a Dh10 taxi-ride and head just out of town to the excellent Auberge Dardara. There’s home-made goats cheese, freshly picked vegetables and unusual dishes such as rabbit with quince or venison with dried figs. Book in advance on 05 39 70 70 07. The Hotel Parador has good views over the mountains. You can get a beer in the bar, but wine is only served with dinner which is best avoided. Up on the mountainside is the Atlas Chaouen Hotel that has a classy bar. If you’re really keen (though women might not feel comfortable), head for the Bar Oum-Rabia on Avenue Hassan II in the new town.